The Berkman Center for Internet & Society at Harvard University has opened its annual call for fellowship applications. 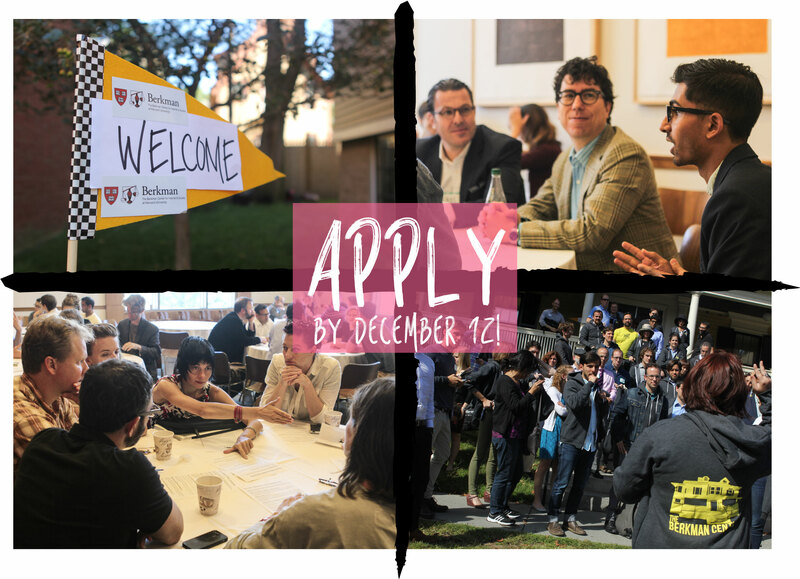 This opportunity is for those who wish to spend the 2015-2016 academic year in residence in Cambridge, MA as part of Berkman's community of pioneers, and who seek to deeply engage in the collaborative, cross-disciplinary, and cross-sectoral exploration of some of the Internet's most interesting, challenging, and compelling issues. Applications will be accepted through Friday December 12, 2014 at 11:59 p.m. Eastern Time. “The Berkman Center's mission is to explore and understand cyberspace; to study its development, dynamics, norms, and standards; and to assess the need or lack thereof for laws and sanctions. Inspired by our mission statement, the Berkman Center’s fellowship program provides the opportunity for some of the world’s most innovative thinkers and changemakers to hone and share ideas, find camaraderie, and spawn new initiatives. The program aims to encourage and support fellows in an inviting and rigorous intellectual environment, with community activities designed to foster inquiry and to identify and expose the common threads across fellows’ individual activities. Fellows actively participate in exchanges through a weekly fellows hour, fellows-run working groups, and a wide-range of Berkman Center events and interactions. While engaging in both substance and process, much of what makes the fellowship program rewarding is created each year by the fellows themselves to address their own interests and priorities. These entrepreneurial, collaborative ventures – ranging from goal-oriented to experimental, from rigorous to humorous – are what ensure the dynamism of the fellows, the fellowship program, and the Berkman community. Additionally, with Berkman faculty, students, staff, and other affiliates, fellows help to develop and advance their own work and Berkman Center projects, and they learn and teach through courses, skill sharing, hacking and development sessions, cultural productions, and other gatherings. Fellows are essential to the Berkman Center as nodes of intelligence, insight, energy, and knowledge-sharing. From their diverse backgrounds and wide-ranging physical and virtual travels, Berkman Center fellows bring fresh ideas, skills, passion, and connections to the Center and its community, and from their time spent in Cambridge help build and extend new perspectives and initiatives out into the world. An appointment that defies one-size-fits-all description, each Berkman fellowship carries a unique set of opportunities, responsibilities and expectations. All fellows engage issues related to the fairly limitless expanse of Internet & society issues, and are committed to the intellectual life of the Center and fellowship program activities. Some fellows work as researchers directly on Berkman Center projects. Other fellowships consist of independent work, such as the research and writing of a manuscript or series of papers, the vision and planning of an action-oriented meeting, or the development and implementation of an initiative or a study on issues related to the Berkman Center’s areas of inquiry. Fellowship terms typically run the course of the academic year, roughly from the beginning of September through the end of May. In some instances, fellows are re-appointed for consecutive fellowship terms. While we embrace our many virtual connections, spending time together in person remains essential. In order to maximize their engagement with the community, during their fellowship terms fellows are expected to routinely spend time in and conduct much of their work from Cambridge, in most cases requiring residency. Tuesdays hold particular importance as it is the day the fellows community meets for a weekly fellows hour, in addition to it being the day Berkman hosts our public luncheon series; as such, we ask that fellows commit to spending as many Tuesdays at the Center as is possible. We do not have a defined set of requirements for the fellows we select through our open call; we welcome applications from a wildly diverse range of people. Fellows come from across the disciplinary spectrum and different life paths, and are at all stages of career development. Some fellows are academics, whether students, post-docs, or professors. Others come from outside academia, and include lawyers, philosophers, activists, technologists, entrepreneurs, journalists, and other types of practitioners. The commonality among all Berkman fellows is an interest in the intersections of the Internet and related emergent technologies, social change, and policy and regulatory developments, as well as a commitment to spending their fellowship exploring those dynamics in concert with others. To learn more about the work and interests of our current community of fellows, you can read their bios and find links to their outstanding work, check out their blogs, and find them on twitter. The work and well-being of the Berkman Center for Internet & Society are strengthened profoundly by the diversity of our network and our differences in background, culture, experience, national origin, religion, sexual orientation, and much more. We actively seek and welcome applications from people of color, women, the LGBTQIA community, and persons with disabilities, as well as applications from researchers and practitioners from across the spectrum of disciplines and methods. The roots of this deep commitment are many and, appropriately, diverse. We welcome your inquiries, comments, and ideas on how we may continue to improve. The Berkman Center for Internet & Society at Harvard University is a research program founded to explore cyberspace, share in its study, and help pioneer its development. Founded in 1997, through a generous gift from Jack N. and Lillian R. Berkman, the Center is home to an ever-growing community of faculty, fellows, staff, and affiliates working on projects that span the broad range of intersections between cyberspace, technology, and society. To learn more about Berkman's current activities and interests, consider watching a video of a Fall 2014 lunch talk led by Berkman's Faculty Director Jonathan Zittrain. More information about fellows selection and the application process can be found on our Fellows Program FAQ.